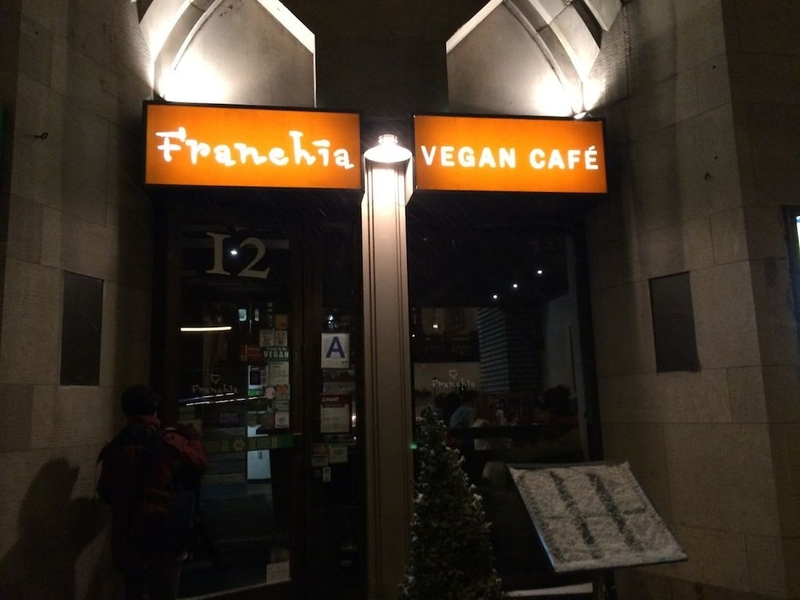 While attending a Broadway show in New York City this weekend, I had the opportunity to visit a lovely little Korean teahouse and vegan restaurant named Franchia. I confess that I learned about the food first and was drawn in by the tea only after I decided to go. So many restaurants these days will put “teahouse” in their name, meaning that yes, like every other restaurant, they serve something almost, but not quite, entirely unlike tea. Sorry, I get carried away. Actually most places willing to call themselves a teahouse do indeed have tasty tea, but Franchia definitely impressed me with their unique offerings. I’m familiar with Nok Cha (녹차, or “Green tea”), the delicate tea lovingly produced in Korean gardens, by way of the versions (apparently Jiri Mountain “Jungjak”) procured by Dobra Tea. That hardly qualifies me as experienced, though. I’ve rarely had the opportunity to try any other varieties, but more and more I have read about the delicious things coming out of Korea and now I’ve grown quite curious. It’s been on my to-do list for a few years now to gain at least a little more familiarity with tea from this country. Well, I was fortunate to stumble across this gem in New York. I highly recommend them for both their food and their camellia sinensis! They offer three harvests of their “Wild Green Tea”. The menu gives water temperatures for each tea, which is already a good sign. Being as it is the middle of winter, I wasn’t sure which one to pick, but I opted for the middle ground and chose the 2nd harvest. Just as I had come to expect from my previous experiences, the ceramic strainer (I love Korean tea cups) was filled with beautiful whole leaf sets that produced a creamy, but very light-bodied broth. The aroma was a combination of roasted hazelnuts and toasted seaweed that I tend to associate with fine Japanese Gyokuro and Kabusecha. Intoxicating. The taste was delicate and sweet. I found I was able to get just about 3 infusions from the leaves before they began to lose their luster. This also meshes with my previous experiences of Korean greens. Still, there were hints of flowers and a little roastiness that I would like to know better, perhaps with longer infusions. If I hadn’t had to get to a show, I would have sat and tried all three harvests! In my haste to leave, I didn’t even notice that they sell their tea. I will definitely have to return during my next trip South. Perhaps if any one else out there in tea-land has a chance to visit Franchia, they can add their reviews to mine. In the mean time, I will definitely need to check out some Korean offerings from others on the ‘net. 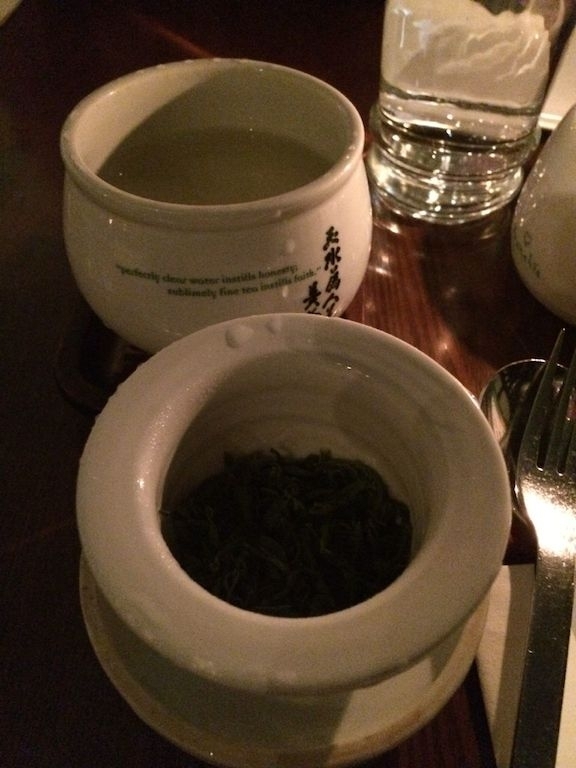 This entry was posted in Tastings and tagged green tea, korean tea, new york, nok cha on December 16, 2013 by payton. 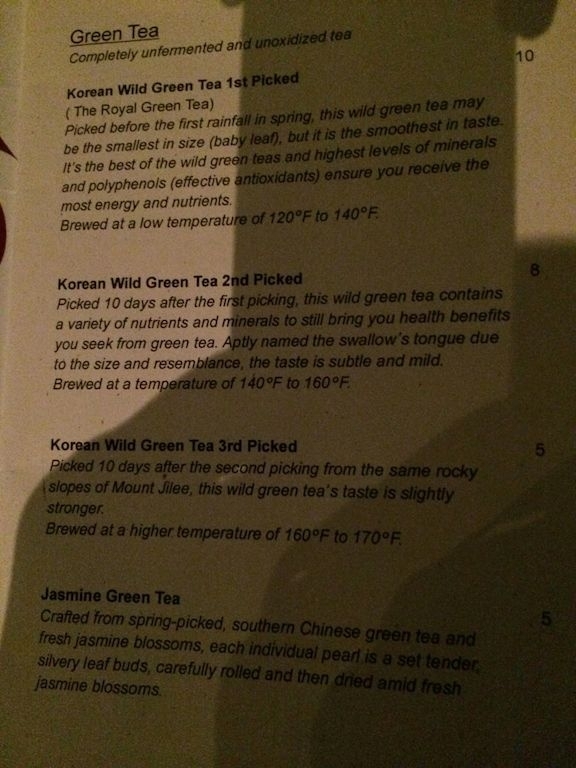 I can’t say I’m very familiar with Korean teas either, but that presentation sounds lovely. I’m more likely to get to Korea than to New York any time soon, but I’d keep this place in mind if I’m ever there!